This is the first completed jacket. 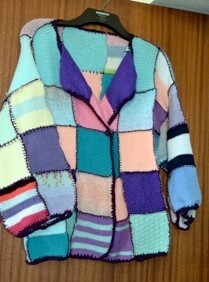 It takes 79 squares to make the one jacket, then the edges are crochet, to give a neater finish. 29th April. Our second sew- in day. 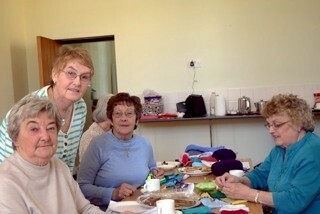 Mrs Fay Killa instructing Mrs Marianne Williams, Mrs Enid Davies and Mrs Nona Thomas in their tasks, as they missed the initial sewing day due to a celebratory birthday. 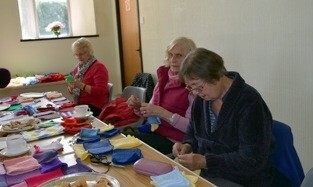 Mrs Myfanwy Coles and Mrs Gwladys Phillips with two members from Felinfoel MU, namely Mrs Dorothy Thomas and Mrs Angela Boswell busy sewing their squares together. On the 28th April, Tinopolis came to film our endeavour, so we roped the men in as well to help with the sewing session, namely our vicar Canon Huw Mosford, also Alun Horan and Reinallt both from Tinopolis. 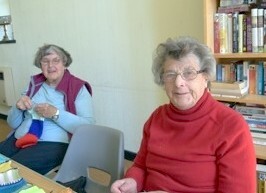 Mrs Audrey Williams and Mrs Eirwen Williams smiling happily through their sewing. April 28th Day 1 of the sewing day with Mrs Myfanwy Coles, Mrs Margaret Bowen Thomas and Mrs Janet Williams concentrating hard on their tasks. 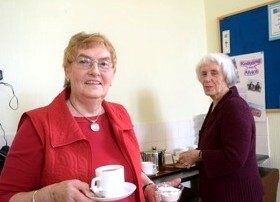 Mrs Bernice Thomas and Mrs Fay Killa preparing refreshments for the busy sewers. 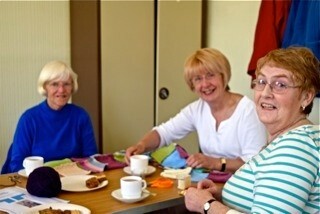 Mrs Betty Jenkins, Mrs Susan Morgan and Mrs Fay Killa enjoying their sewing interlude with a cup of tea. 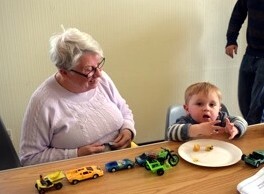 Mrs Carol Hodson with her grandson Tom (who is only 2) but was as good as gold during our sewing session.